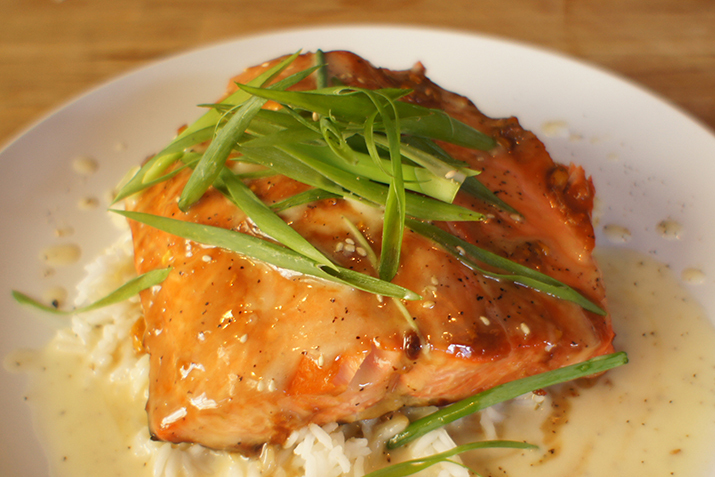 Miso adds umami to this simple miso-glazed salmon with an optional ginger beurre blanc sauce. In a small bowl, whisk together ginger, garlic, white miso, soy sauce, mirin, brown sugar, black pepper and red pepper flakes. Coat the bottom of baking dish with oil and lay salmon in dish skin side down. Brush marinade evenly over salmon and let marinate in refrigerator for 10-15 minutes. Bake at 425°F for 8-10 minutes per inch (thickness) of fish, basting with remaining miso marinade if desired. Salmon is done when it can be easily flaked with a fork. Serve atop a bed of rice and garnish with green onion and toasted sesame seeds. May also be served with ginger beurre blanc sauce.